Most of us have heard that saying at some point in our lives: Keep It Simple Stupid (KISS). First coined by the US Navy as a design principle in the 1960s, it's something that I need to periodically remind myself. Sometimes, however, the engineer gets the better of me. You can see that in the incredibly elaborate mechanical and electrical system I built for my version of the sand plotter in comparison to the simple mechanism designed by Bruce Shapiro for his Sisyphus. Though I got some great learnings from attempting to tackle that project, my version has ended up in the scrap heap. Well, a more recent project has reminded me of this principle yet again, at the cost of a $400 burned-out circuit board, not to mention the development of the over-engineered solution, costing much more in coin and sweat over the weeks I attempted to get it working. ... given the single point suspension of the lift at the ceiling! So as I lift the CNC into the ceiling, I have to be very careful to make sure the platform is balanced front to back. Sure, I could do this manually... but this could get super tedious if I'm using it every day, so this led me down a tortuous path to automate the process. Powering the movement. 3A at 12V is fairly modest in power supplies, but no mercury switch I could find could handle that, so I had to add a pair of relays. Actually, I would have needed at least one relay anyways to make sure that a delayed opening of a mercury switch (or bad positioning of them) wouldn't lead to a short circuit in reversing the motor direction and current. Wait! 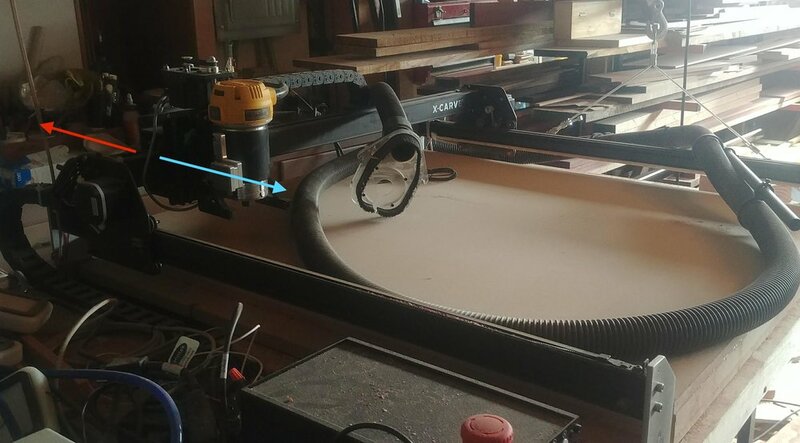 I don't need a separate 60 pound counterweight - the gantry on the X Carve itself can slide back and forth, and since it carries the hefty router as well, this would serve as a perfect counterweight without adding more pounds! The gantry is that bar outlined in white, that slides back and forth with the router (the yellow thing - it does the actual carving) attached. Circled in red is one motor that moves the gantry; there's an identical one on the opposite end. The "X Controller" is outlined in turquoise - not much of a picture - but we'll return to the electrical insides of this later. But it does add a lot of electrical complexity (which is why I did not pursue this idea first). That is, the gantry is moved by a pair of stepper motors, which are ordinarily controlled by the circuitry that comes with the X Carve (called the "X Controller"). And I definitely want to make sure I don't damage that circuitry by, perhaps, sending current back into the device when its not expecting it. So that means there's two problems I have to tackle: first, making sure my counterbalancing system only turns on when the X Controller is off, and second, having those mercury switches activate stepper motors rather than a simple DC motor. For the first part, I found this nifty little device and routed the X Controller power through it. When attached to a relay, that ensures that the counterbalancing controls are only powered up when the X Controller is turned off. The second part allowed me to reuse some of the learnings (and parts) I had gained earlier with my abandoned sand plotter project, using an Arduino microcontroller and a pair of stepper motor shields, I could control the two motors. It worked with a basic test! Or so I thought... but I'll come back to that. Since I had a fairly large project box (and a multi-voltage power supply), I took advantage of the extra space for some other electrical enhancements I made: extra LED lighting; the power for the laser module; the foundation for a future closed loop speed controller for the router via the Super PID. So that spacious box became quite crowded afterall. Red: two power supplies, one for the 24v of the laser, and one for the 5v & 12v of the steppers, LEDs, and digital circuitry. Blue: the Arduino and stepper motor controller. Green: mercury tilt switches. Yellow: three relays, two to separate the two stepper motors from the X Controller, and one for the laser module. Orange: Dwyer current switch to detect when the X Controller is on. Turquoise: the power input / output, for two independent circuits so that the high power router of the CNC can be separated from the more delicate circuitry, and allowing for future router speed control. Purple: Wow there's a lot going on in here, we should probably have some fans to keep it all cool! Looks so much cleaner and actually organized from the outside! The inputs & outputs for the steppers, the main power, and various low voltage supplies. But everything "unit tests", or works when individually tested, so I plug it all in and start using it. And there's two problems. Those four big chips at the back are the stepper motor drivers for the X Controller, much heftier than those used with my Arduino. First, it actually doesn't work. The stepper motors require a lot of power, especially given the weight of the gantry and the router. The X Controller has a very powerful chip, the Toshiba TB6600, to drive those motors. You can see the four big vertical chips at the back of this board. The driver I'm using attached to the Arduino is puny in comparison. So while it does attempt to move the gantry in the correct direction, because that movement is against gravity - that is, if the platform is tilted forward, the circuitry will attempt to move the gantry uphill in the opposite direction until the platform starts leveling out - there just ain't enough power. I try increasing the motor voltage from 12V up to the driver limit of about 15V, but still no go. In fact, the driver starts shutting down due to overheating. Drats. But it doesn't cause any problems, so I just leave it in place. And a few months go by, until I finally get to a project where I start using the 24V laser engraver that is also powered by wiring in the same project box. I don my goggles, get the fire extinguisher handy, turn on the laser, and start smelling something smoking. Not the smoking of a laser that is burning through the wood - I smell that too - but the smoking of burning electronics. Still, as I'm unsure, I turn everything off, and then repeat the experiment. And this time, I start seeing smoke coming from the X Controller. Double drats! After opening up the X Controller, I can see that one of the four high power stepper motor chips has been fried! I don't try to troubleshoot my rats nest of wiring; rather I just disconnect the whole darn thing, and cry. Or more specifically, I reach out to Inventables, the manufacturer of the X Carve, and I explain the fried chip. Check out the vertical black chip, second from right. See that brownish-black stain on it? That's a burn mark, presumably somehow caused by my separate controller sending power back to this board at the wrong time. Exactly what was the root cause, I never figured out. But I did figure out that this board is now fried. Kudos to them, amazing customer service, they ship out a new circuit board with priority shipping. So a few days later, I'm back up and running, but with a much reduced and simplified wiring setup: an independent regulated power supply for the laser, and nothing else. Finally, I've found a solution that works: turn the power to the CNC off. Then manually move - with my hand! - the gantry to the position where the platform is balanced. Voila! It works! Final solution: If the table tips forward, push the gantry to the back (in the direction of the red arrow). If the table tips backward, push the gantry to the front (in the direction of the blue arrow). Granted, when I started trying to solve this problem, I thought I'd be raising and lowering the CNC daily, perhaps several times a day, whereas after a few months of use I find I lower the CNC for a project - which may last one day or three weeks - and then only when done with that project, raise it back up. So rather than balancing the platform 300-600 times a year, it'll probably be 20-30. If I could start over, though, I'd get that more expensive garage lift... or maybe its just time for a larger workshop! "Do you miss the office job?"